Tonight, I had a pre- bedtime talk with my oldest sons. And one was pouring out a frustrated heart. He was feeling the pressure of our days and busyness. Busyness can eat away at the beautiful and the good. There is a hecticness at odds with strong, soul-full purposed days. We are feeling some of that and I have been hard pressed to find ways to keep our center and priorities straight at times. In fact, I would say, we haven’t been doing too well with that. And it is here that I drink from the cup of grace like a desperate man (woman). And I throw myself wholeheartedly upon the Lord in trust as I have seen Him make a way again and again when I cannot see the way (and O! that is hard for me but O! His amazing faithfulness!!). But I digress (a bit)… for some of the pent up frustration was coming from a lack of time to write for this particular child. A lack of time to sit and ponder… he told me he had taken to writing in composition books that he could carry with him wherever he was as it can be so challenging to find the time to sit at a computer…but even that routine was being pushed out with a sense of pressure and busyness… not to mention that he was just feeling that he didn’t have much time with the full credit load he is carrying plus activities. He is right. He is at his busiest right now and there isn’t much time. He is feeling it. He can’t hear the writing voice inside of him. There is too much noise. I looked at that child. And I said(something along these lines)- in the face of his frustration- and yes, fear. Fear for where was that inner place so much a part of him- so muffled now in noise? I said- “To write you need time, and space, and quiet. Time to stretch out and think and listen. And it is natural and normal that you do not have that right now. Wait until after this season and the words will come again. Just because you are busy and cannot hear the stories, doesn’t mean that the gift is not in you. The gift is in you.” And as the words left my mouth, I startled. And inside I felt a deep inner witness, for I knew in my heart, I was also speaking to myself. I was speaking to myself. And the grace I offered my child, is the grace offered to me. And of course, my mind went a hundred directions on how could we possibly better organize time to give a routine that would enable him to write. But I didn’t offer any of that this night. I didn’t offer a solution to the problem or figure out a way to make it work. I just affirmed. The gift is still within him and that hasn’t changed because the circumstances of his life are pressing in a different way and we are just figuring out how to get through and stay afloat. No. The gift is his forever because it is a part of who he is. So, I now take a little time to capture that moment to my own heart. Try to feel the full weight of its impact. And listen. To write…is to truly live. For me. So I do. When Micah was in first or second grade, we used a lovely curriculum called Living Books Curriculum. 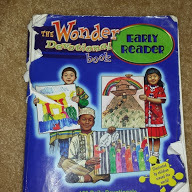 Included in this program was a devotional resource called: The Wonder Devotional Book. It was published by Child Evangelism Fellowship (CEF). This resource is written right at the first and second grade reading level. Sadly, this book is not in print. 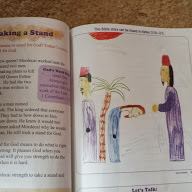 When Abigaile, who was the fourth child to go through this devotional, got to the end of this book she discovered an invitation to participate in CEF’s Truth Chasers club. She asked if she could join. She then faithfully proceeded to diligently complete lessons- often saving them for Sundays as a special treat just for that day. 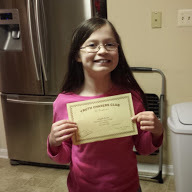 She completed the first level and received a lovely certificate. Fall semester we were surprised, proud, and thrilled to realize that she completed the second level. 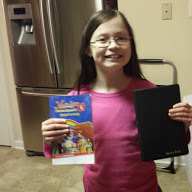 She received a beautiful ESV Bible monogrammed with her name spelled perfectly correct and a sweet little devotional book that she set aside for special Sunday reading. What a treasure this precious Bible is! As she has worked through the lessons, she has been encouraged by little notes from the graders and encouraging words. It has been great fun for her to receive this special mail. The lessons carefully and slowly advance in difficulty. This is a wonderful, free resource that has been an incredible blessing. And, I am so proud of my girl. She is quiet and reserved but very determined. This year she has earned two important awards (more on the second one later). And she did them both with quiet determination and courage and all on her own initiative. I hope , in sharing this, someone else might be encouraged to take advantage of these special lessons. I feel that this is a hidden treasure. I edited and updated this Christmas post just a bit…for those who might be curious. I added a few pertinent facts and clarified my writing a bit. Happy New Year! I disappeared completely through Christmas as our family all went down en masse with illness. Truthfully, we are still getting back on our feet with some residual coughs and sniffles, with Christmas STILL up at our house, and with much organizing and paperwork needed to be done. Here is a new recipe just created by me. It is dairy free but I am sure you could certainly sub dairy items in place of my alternatives. You can also use almond milk, soy milk, or another milk alternative in place of the canned coconut milk. I made this recipe half-size the one I am posting. I doubled the ingredients as I plan to make this for my whole family. Place diced onion and carrots in bottom of soup pot and drizzle with olive oil. Turn on high and begin to cook. Add garlic or garlic powder. Add Bags of Frozen Cauliflower and cook just a bit til starting to steam and almost brown. Fill soup pot with water and bring to a boil. Cook and simmer until cauliflower is soft and tender (about 20 minutes). Season with salt and pepper. Keep pot simmering and remove 1/2 – 3/4 of cauliflower and cream in blender. Pour back into pot. Add daiya, coconut milk, and chopped meat. Swirl in spinach. Season again with salt and pepper to taste. Serve as is or with crusty home-made bread. Yum!